We are excited to announce that the Equicizer will be attending Equine Affaire in Columbus, Ohio this April! We will be joining Steve Lantvit Horsemanship in their booth from April 6th-9th and we hope you'll come out and say hello! This is a great opportunity to speak to Equicizer creator and builder, Frankie Lovato, as well as see and try the Equicizer in person (if you haven't already done so). It's also a great opportunity to meet and speak to Steve Lantvit, who is not only an award-winning trainer and instructor but also one of the headliners at Equine Affaire this year. We can't say too much yet but we will be launching a new Equicizer product which we'll be bringing along with us for everyone to see and try as well, so we hope to see you there!! You can learn more information about tickets and presenters for Equine Affaire by clicking here. Horseman's Minute is a segment of Steve Lantvit's show "Sure in the Saddle" brought to you by the Equicizer! Check out this brand new show segment where Steve Lantvit showcases riding tips aboard an Equicizer. You can check out some YouTube clips of previous Horseman's Minutes on the Steve Lantvit Horsemanship website under "SL Horseman's Minute". Some examples of topics he has covered so far include shortening reins while riding in a bridge, proper riding alignment, and riding in the center of your saddle. "Sure in the Saddle" airs on RFD-TV on Thursdays at 3pm and 11pm EST. RFD-TV describes the show by saying, " Renowned award-winning equine clinician, Steve Lantvit, has a fresh and innovative approach to training individuals and horses. Steve's foundation is derived from the practical application of top level performance and skills funneled into a philosophy that allows all riders to succeed on the trail or in the show pen." Be sure to follow Equicizer on Facebook so that you are getting reminders to tune in! We're excited about this collaboration and the great advice that is being offered. Click here to watch all of the Horseman's Minute segments up to this point! 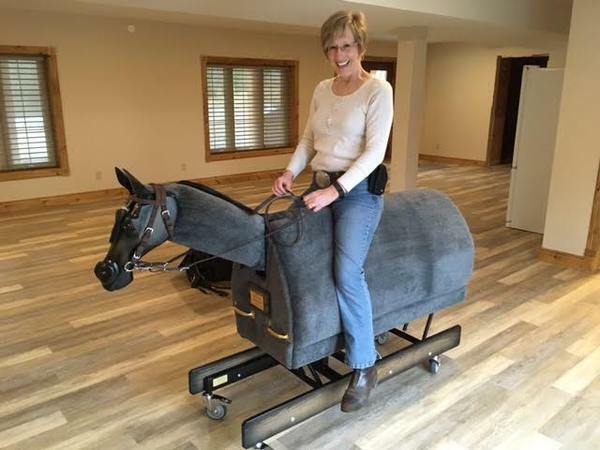 Pictured is new Equicizer owner Joan. 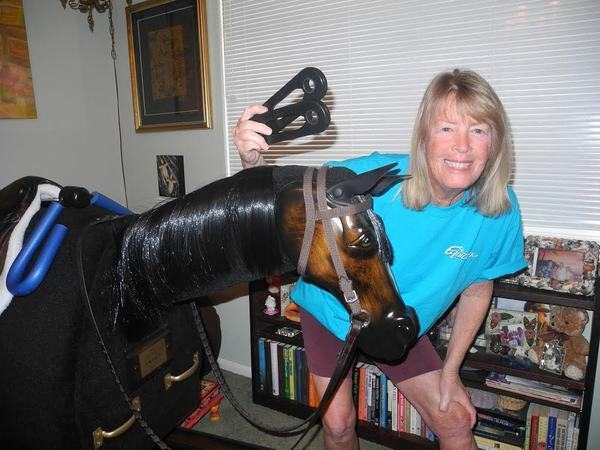 Joan recently purchased her Equicizer "Cowboy" and it looks like they are getting along just great. Congratulations, Joan! "My husband bought me my Chance two years ago for our anniversary and it's the absolutely best gift I have ever been given. He knew that it was time for me to give up riding real horses, but he knew how good the motion of the horse was for me. I was diagnosed with MS 23 years ago. Although I am managing it ok, being able to ride Chance and do exercises on him has clearly made a difference in my life. For me, Chance is my chance to stay fit from riding. Debra won an Equicizer t-shirt for herself and neck bands for Chance! Head over to our blog, Wooden Horse Wednesday, to read more testimonials like Debra's! We are so grateful to share in the joys that the Equicizer brings to our customers. If you have one to share, please click the link above to email it to us!